•For the treatment of tick and flea infestation in cats. •A systemic insecticide and acaricide that provides immediate and persistent flea and tick killing activity for 12 weeks. •It can be used as a part of a treatment strategy for the control of flea allergy dermatitis. Each ml contains 280mg fluralaner. For the treatment of tick and flea infestation in cats. 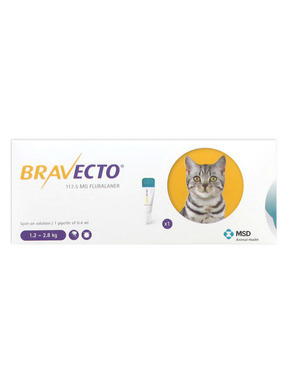 This veterinary medicinal product is a systemic insecticide and acaricide that provides immediate and persistent flea (Ctenocephalides felis) and tick (Ixodes ricinus) killing activity for 12 weeks. Fleas and ticks must attach to the host and commence feeding in order to be exposed to the active substance. Commonly observed adverse reactions in clinical trials were mild and transient skin reactions at the application site (2.2% of treated cats), such as erythema and pruritus or alopecia. The following other signs shortly after administration were observed: apathy/tremors/anorexia (0.9% of treated cats) or vomiting/hypersalivation(0.4% of treated cats). Step 1: Immediately before use, open the sachet and remove the pipette. The pipette should be held by the base or by the upper rigid portion below the cap in an upright position (tip up) for opening. The twist-and-use cap should be rotated clockwise or counter-clockwise one full turn. The cap will stay on the pipette; it is not possible to remove it. The pipette is open and ready for application when the breaking of the seal is felt. Step 2: The cat should be standing or lying with its back horizontal for easy application. Place the pipette tip on the base of the skull of the cat. Step 3: Squeeze the pipette gently and apply the entire contents directly to the cat's skin. The product should be applied on cats up to 6.25 kg body weight in one spot at the base of the skull and in two spots on cats greater than 6.25 kg body weight. Treatment schedule: For optimal control of tick and flea infestation, the product should be administered at intervals of 12 weeks. STORAGE:Keep out of the sight and reach of children. This does not require any special temperature storage conditions. The pipettes should be kept in the outer packaging to prevent solvent loss or moisture uptake. The sachets should only be opened immediately prior to use. Do not use after the expiry date stated on the packaging after EXP. The expiry date refers to the last day of that month. I just started using this on my cats. I have used Bravecto on my dog for years with great results so I decided to try this. Love, love, love this! My cats are indoor/outdoor in Southeast Texas where we have Texas size fleas. This product has worked like a charm and I have not seen a flea in 3 months. Just reordered for all my hair babies. Happy cats happy Momma. We have 7 cats. They don't roam around but somehow became infested with fleas. I bought this product and it completely took care of the problem. We are going into month 3, and they are still flea free.